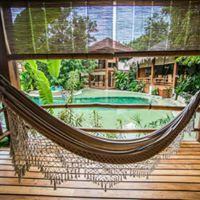 Join Ashley Halley and Marley Vigdorth for a week devoted to the perfect blending of play and restoration at Pranamar Villas in Santa Teresa, Costa Rica with special guest DJ Drez! 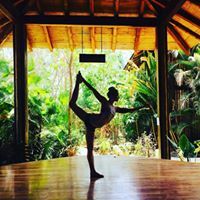 The retreat space is located directly on one of the most stunning beaches in the world, a perfect backdrop to deepen your yoga practice and reconnect to an inner state of joy and centeredness. “An intimate, consciously designed oceanfront hotel built on the spectacular beach of Playa Santa Teresa, offers guests tropical beauty and nature in an exotic and friendly ambiance. Immerse yourself in the beauty and ease into nature’s rhythm as Pranamar’s experienced and caring staff take care of all the details, making sure your vacation is perfect…"
Does not include airfare, transfer between airport and Pranamar, alcohol, spa treatments, excursion or gratuities. 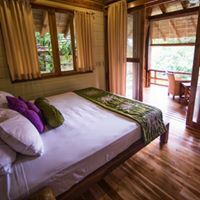 Kula House (Women’s Dorm): Large two story house includes a bedroom downstairswith either 1 king bed or two twins connected to a small living room, kitchen, and bath, and opens out to a large deck. Upstairs is dorm style with 1 queen, 3 twins and private bath with ocean views and plenty of space to relax on the upper balcony. Includes A/C, fans, and security safe. Poolside Villa: Two-story villa has two air-conditioned bedrooms, two bathrooms, a living room with large balconies and hammocks. Poolside Villas also include personal pool entrance, fans, screens, small bar fridge, garden bathrooms with granite stone tub, security safes, Wi-Fi, and two king beds or one king and two single beds. Oceanfront Bungalow: 1-level bungalow with 1 king bed and private bath located directly in front of the beach. Includes a large deck with hammock and outdoor seating and small kitchenette. Includes A/C, fans, and security safe. Garden Bungalow: 1-level bungalow with 1 queen bed or 2 twins and private bathroom. A large deck and small living space offers private lounging areas and small kitchentte. Includes A/C, fans, and security safe. Oceanfront Villa: Two-story villa located directly in front of the beach. Upstairs has twoextra spacious air-conditioned bedrooms with one king or two single beds and private bathrooms. 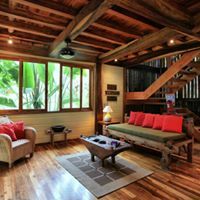 Downstairs is a full kitchen, living room space, and oversized verandas with hammocks . * Please note for all Villa accommodations, if booking a single you will have your own room and bath within a two bedroom villa. If booking a double you will be sharing a room and bath with one person within a two bedroom villa. Meals: Pranamar’s restaurant sources the freshest produce and organic local ingredients whenever possible. 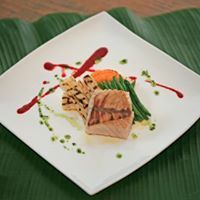 Their style combines Pacific Rim cuisine with Asian and native influences to create meals with simple, delicious flavor. A variety of dietary needs can be accommodated including vegan, vegetarian, gluten free and any food allergies. You will fly to Juan Santamaria Airport (SJO) in San Jose, Costa Rica. 2. Flying Natureair or Sansa Airlines to Tambor (TMU) where a taxi can be arranged to transfer you to Pranamar. 3. Arrange a charter flight from SJO to Tambor (TMU) for up to four people. *Please note if your flight arrives in or leaves out of SJO after 2pm before or after the retreat, you may need to stay overnight in San Jose. For more information and help with flights please contact your retreat leaders or Pranamar Villas directly. Santa Teresa Beach is custom-built for fun. You have the perfect combination of relaxing beaches, exciting tropical rainforest and luxurious accommodations and spas. White sand beaches, lush vegetation and spectacular sunsets set an amazing stage for your yoga holiday. Along with the two most popular pastimes of surfing and Yoga, a myriad of other activities await you at Pranamar. 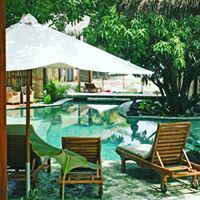 Directly in front of the hotel you will find beautiful tide pools and snorkeling opportunities, while a short 2 minute walk to the north brings you to Playa Hermosa, an expansive, banana tree-lined beach great for swimming, surfing or jogging. Easily accessible half-day adventures include: horseback riding, canopy zip lining, fishing, and hiking to nearby waterfalls or through the Cabo Blanco Absolute Reserve. Also nearby are boat tours to Tortuga Island for crystal clear snorkeling dives, sea kayaking to secret caves, deep sea fishing or a visit to Rainsong Animal Rescue Center.